Autosmart International is the UK's largest manufacturer of professional vehicle cleaning products to the trade. 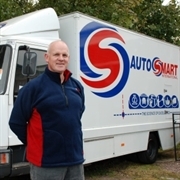 Autosmart has been helping franchisees to make a success of their businesses for over 35 years and is one of the UK's most established franchises, with a network of 225 franchisees worldwide. The Watford & Hemel Hempstead franchise opportunity is an established and profitable business covering an area from Watford, along the M1 corridor to Hemel Hempstead and across to Berkhamsted. There are around 120 regular repeat customers from road haulage services and car dealerships to food processing plants and manufacturing businesses, who have been buying Autosmart products for between 5 and 20 years. The Autosmart franchisee operates from a mobile showroom, laid out inside like a supermarket and sells to a diverse customer base within an exclusive territory. As well as supplying the car, bike, truck and bus sector, they will also supply customers like factories, farms, caravan sites, agricultural companies and even funeral parlours. As well as supplying customers such as those above, Autosmart’s national accounts such as APlant, BT Fleet, GAP Plant, Northgate Vehicle Hire, Entreprise Rent A Car, Motorclean, Secure Valeting & Assured Valeting are all located in the Watford area and are regular repeat customers. Restocking existing customers will take up around two-thirds of your time each month, giving you lots of time to focus on growing your turnover even further. With over 200 products at your disposal you will be able to meet the cleaning requirements of every company in your territory. Our franchisees often don't have any sales experience, but they do have determination, a will to win, and plenty of enthusiasm to develop a great business. We have 35 years' experience of turning franchisees who have never sold before into first-class sales people. Your contribution to the funding of this very well established and profitable business is £29,000, however, there are different routes into the business depending on what capital you have available. We will then assist you in raising a business over-draft facility with your preferred choice of bank. The Watford franchise is already well established so with your hard work and commitment you should expect to repay your investment quickly and make a great living. Autosmart is also an award-winning franchise, having won the British Franchise Association's "Franchisor of the Year" award three times, most recently in 2014. Exclusive territory around Watford, including Hemel Hempstead and Berkhamsted. Small unit with mobile showroom. It’s really important to us that you get off to a great start. A 5 day induction course at our head office will give you basic product and sales skills, as well as an insight into our marketplace. But to really give your business a kick-start, we allocate you a Regional Business Manager (RBM) who is a sales coach and trusted business advisor and will provide you with tailor-made field support.